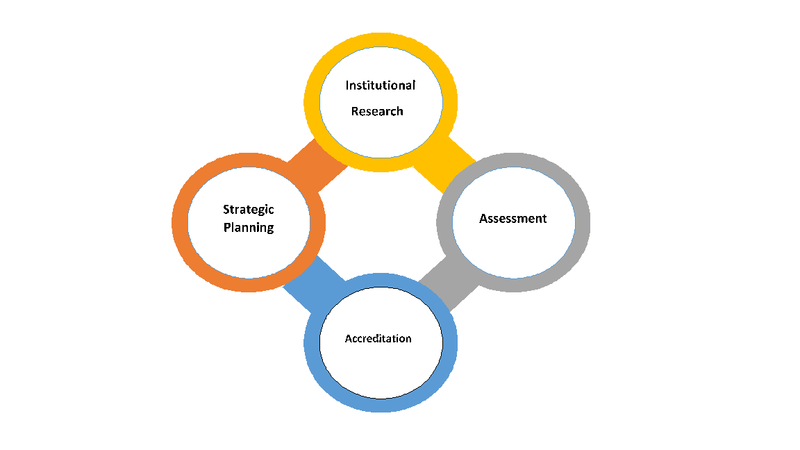 The Office of Planning and Institutional Effectiveness is responsible for four key functions of the college including: strategic planning, institutional research, assessment (student learning, program, and administrative), and accreditation. Connection through college wide planning, research, program review, outcomes assessment, recourse development, and accreditation. Completion through creating a culture of evidence based decision making that helps the College to maintain the integrity of its principles and outcomes. Meets with campus stakeholders to discuss data in various meetings and conferences. Provides data support for various institutional grants and initiative. Creates custom surveys for data collection on campus. Completes reports for compliance purposes for local, state and federal mandating bodies. Provides data analysis for the program review process. Provides direction and support for the Institutional Learning Outcomes evaluation. Responds to data request from faculty,staff, students and other internal and external parties. Provides annual and or quarterly data reports in the form of dashboards, excel documents and tables..
Fortify data accuracy, consistency and integrity across the college. This site is a hub that users will find easy to navigate via the headers on the right sidebar. Should you have any suggestions,require information, or have useful information to post, please contact Debbie Smarr, dsmarr@grayson.edu or any of us.